With the 2018 holiday season in full swing, many-a-restaurant is offering an extra bonus, deal, or freebie when you buy a gift card from them. I've complied a list of the bonuses for your reference. Some promotions are online only, while others are "at participating locations only" so be sure to ask. - Applebee's - Get a $10 bonus card when you buy $50 in gift cards. Offer good through 1/6/19. Bonus card expires 3/3/19. - Benihana - Get a $10 bonus card for every $50 in gift cards you buy through December 31, 2018. Bonus card is valid 1/2/19 through 3/31/19. - BJ's Brewhouse - Get a $10 bonus card & 20% off VIP card for every $50 worth of BJ's e-gift cards purchased or a $25 bonus card for every $100 worth of e-gift cards plus a 20% off VIP card, while supplies last, through 1/1/19. Bonus card and VIP card are valid 1/1/19 - 2/13/19. - Blaze Pizza - Get a free pizza card when you buy $25 in gift cards through 12/31/18. Card is valid 1/1/19 - 2/28/19. - Bonefish Grill - Free $10 bonus card with every $50 in gift cards purchased through 12/31/18. Bonus card is valid at Outback, Carrabba's, Bonefish Grill, and Fleming's from 1/1/19 - 2/10/19. - Boston Market - Free $5 bonus card with each $25 gift card purchase thorough 12/31/18 online and at participating restaurants, while supplies last. Bonus card is good 11/23/18 through 1/31/19. - Bravo Cucina Italiana - Free $10 bonus card with each $50 in gift cards purchased through 12/31/18. Bonus card is valid 1/1/19 through 3/15/19. - Bruegger's Bagels - Free $5 bonus card when you buy $25 in gift cards through 12/31/2018. Bonus card is valid 1/1/19 - 2/28/19. - Buca di Beppo - *Online only* Get two $10 bonus cards with every $50 gift card purchase on 11/23/2018 only. Bonus cards valid 1/1/19 through 2/28/19. - Buffalo Wild Wings - Get a $5 bonus when you buy $25 in gift cards through 12/31/18 (limit 4 per person, while supplies last). Bonus card is valid 1/1/19 through 2/28/19. - California Pizza Kitchen - Get a $20 bonus card when you buy $100 in gift cards through 1/1/19. $20 bonus card is valid 1/7/19 - 2/24/19. - Cheesecake Factory - 11/23/18 to 11/26/18 - Get two eSlice of Joy Cards (each good for a free slice of cheesecake) for every $25 in gift cards or eGift cards purchased online. Each eSlice of Joy Card is redeemable from 1/1/19 - 3/31/19. - Chili's - Get a $10 bonus card when you buy $50 in gift cards through 12/31/18. Bonus card is valid 1/1/19 through 2/6/19. - Cotton Patch Cafe - Free $5 bonus card when you buy $25 in gift cards. Bonus card good 1/1/19 through 2/28/19. *11/23/18 only* - Get $10 bonus card when you buy $25 gift card. - Culver's - Get a certificate good for a free value basket when you buy $30 or more gift cards through 12/30/18. Certificates expire 2/28/19. 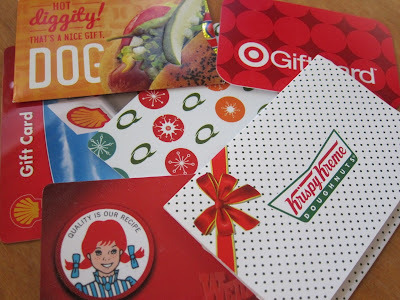 - Purchase $100 in gift cards online and receive four coupons each good for one free Small Size Combo Meal. Cyber Monday bonuses on November 26 and November 27 ,2018 get two times the number of coupons (i.e. two and eight coupons, respectively). - Denny's - Get $50 in Denny's coupons when you buy a $25 gift card through 12/25/18. - Dunkin' - Get a $10 bonus card when you buy a $25 gift card online through 12/24/18. Bonus card is valid through 1/31/19. - Einstein Bros. - Get a $5 bonus card when you buy a $25 gift card through 12/31/18. Bonus card is valid 1/1/19 - 2/28/19. - Earl of Sandwich - Get two $5 bonus cards when you buy a $25 gift card through 12/31/18. Bonus cards are valid 1/1/19 - 2/28/19. - Houlihan's - Get $10 bonus card for every $50 in gift cards purchased through 12/31/18. Bonus card is valid 1/1/19 - 2/28/19. - Fleming's - Get a $20 bonus card for every $100 you spend on gift cards through 12/31/18. Bonus card is valid 1/1/19 - 2/10/19. - Islands - Get a $5 bonus card for every $25 in gift cards purchased throuhg 12/31/18. Bonus card is valid 1/1/19 - 2/28/19. - Jamba Juice - Get a $5 bonus card when you buy $25 in gift cards through 12/31/18. Bonus card is valid from 1/1/19 through 2/28/19. - Mimi's Cafe - Get a $10 bonus card with every $50 in gift cards purchased. Bonus card valid from 1/1/19 through 2/28/19. - Mod Pizza - Get a card for a free pizza or salad and a 16-oz drink with every $50 gift card purchase through 1/1/19. - Morton's - Get a $50 bonus card when you buy a $250 gift card through 12/24/18. Bonus card is valid 1/1/19 - 5/31/19. - Olive Garden - Get a $10 bonus card with every $50 in gift card purchases through 12/30/18. Bonus card is valid 1/2/19 - 2/10/19. - Outback Steakhouse - Get a $10 bonus card with every $50 gift card purchase through 12/31/18. Bonus card is valid at Outback, Carrabba's, Bonefish Grill, and Fleming's from 1/1/19 - 2/10/19. - Panera Bread - Get a $10 bonus card for every $50 in gift cards purchased through 12/31/18. Bonus card valid 1/1/19 - 1/22/19. - Penn Station - Get a free six-inch sandwich voucher for every $25 in gift cards purchase through the end of December 2018. - Potbelly Sandwich Shop - Free sandwich when you buy a $25 gift card through 12/31/18. - Stonefire Grill - 10% bonus card on online gift card purchases of $50 or more through 11/23/18. - P.F. Chang's - Get a $20 bonus card when you buy $100 in gift cards through 12/31/18. Bonus card is valid 1/1/19 - 2/28/19. - Red Lobster - Get a $10 bonus card when you buy $50 gift card through 12/31/18. Bonus coupon valid January 2019. - Red Robin - Get a $5 bonus card for every $25 gift card purchase through 12/31/18. Bonus card valid 1/1/19 - 2/28/19. - Ruby Tuesday - Get a $15 bonus card for every $50 in gift cards you buy. Bonus card valid 1/2/19 - 3/5/19. - Ruth's Chris Steakhouse - Get a 10% bonus card on gift card purchase of $250 or more through 12/31/18. Bonus card is valid 1/1/19 - 3/31/19. - Steak 'n Shake - Get a $5 bonus certificate when you buy $20 in gift cards through 12/31/18. The certificate is valid 1/1/19 - 2/28/19. - Taco Bell - Get a $5 e-bonus card for every $10 in e-gift cards purchased online. Bonus card is good through 12/24/18. - Taco John's - Get a $5 bonus card for every $25 gift card purchased. - TGI Friday's - Get a $5 bonus card plus for every $25 spent on gift cards, while supplies last, through 12/31/18. Additionally, if you buy $50 or more in gift card in-restaurant, you get a FandangoNow movie code. Bonus card is valid 1/1/19 - 2/28/19. - White Castle - Get a free $5 bonus card with purchase of $25 in gift cards.